We went to the building site almost every day. I measured a similar bathroom in the house we were renting and it was only 5' wide, so making it 6' was actually a mistake on my part and we were happy to have the extra foot of space in the study/bedroom. While standing in the framed-up study/bedroom (with no wallboard up yet), we saw that there was a very nice view of the trees outside a wall which had no window. We decided to spend the extra money to have another window put in. Again, this was not a mistake -- we just had no way of knowing about the view that far off the ground until the house had progressed to that point. Another problem with the study/bedroom was the result of a miscommunication between Craft and us. We had told Craft that we wanted the windows to extend low enough that we could sit at our desks and look out the windows. Craft figured that computer monitors, etc., would block most of the view if the windows started at 36", so he only took them down to 48" to save money. 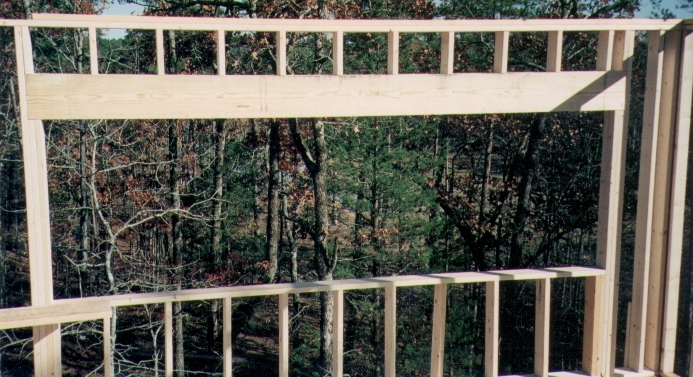 We could not tell from the elevation drawing nor the blueprint just how they would be, but as soon as we saw the framing, we knew they were too high -- there was no way we could see anything but up in the sky while seated. By swapping those windows with some larger windows in other parts of the house, plus ordering some additional windows, we were able to have windows in front of the desks which gave us a good view, but we had to pay about $1000 extra and the windows had to be re-framed and moved. For all the time we have spent at our desks enjoying the views, birds, and squirrels' antics out those windows, it was well worth it, but it would have been better to get it right in the first place. When the sheetrock went up, we caught some other problems that were not obvious when just the framing was up. One was that a closet was not deep enough to hang clothes in (by a few inches). Craft had the sheetrock pulled off and the closet re-framed. This was unfortunate, but it would have been much more unfortunate if it had not been discovered until the house was completed, the floor tile laid, etc. Since this was the sub's mistake, fixing it did not cost us anything. Another problem that became apparent was that in my plans, I had located the master bathroom door over a little too far in one direction. We decided that it was not bad enough to tear apart and re-do (especially since we would have had to pay for it!). Also in the master bath, a window that was supposed to be centered between the shower and the front of a linen cabinet was not centered. This did not become apparent until after the cabinets were installed. By this time, the walls were finished inside and out, and moving the window would have been a major job and expense. We let it go. There have been other problems (leak in the roof, a door opening the wrong way), but Craft caught most of these about the same time we did and took care of them without our saying anything. The time to get the builder to comply with specs is while the work is being done. If you wait until the final walk-through, differences which would be expensive to fix probably won't be done, contract notwithstanding. In theory, you could take the builder to court, but it would have to be something really, really major to justify that, and if it's that important, it should not have gone that long without being discovered and corrected. If you elect not to check the house during the building process, then that's just the chance you take. Nevertheless, if you gave the builder pages of specs, you should review them one last time to make sure that you have checked everything off as it was being done. If you missed checking something or if it was something done near the end, add that to your list of things to check at the final walk-through (or before, if possible). When it is time for the final walk-through, you and the builder will probably find several dozen other small problems which have gone unnoticed before. This is common and should not hold up the close, but you probably should hold back (put into escrow) some of the final payment to insure that the work gets done. It is easy to get excited about finally getting the house and to be less than thorough during the walk-through, and the builder may try to speed you through it too, but if you take your time and do it right, you will be glad in the long run that you did. At Judy's house, Judy did a walk-through prior to the final one, and I did one too a few days before the final, then we both walked through with the builder at the final. Judy and I each caught things on our preliminary walk-throughs which the other person missed, and we and the builder saw even more things at the final. The escrow (and the contract) should also require the builder to fix things which do not show up until after you move in, but it is far better to get as much as you can on the walk-through punch list. 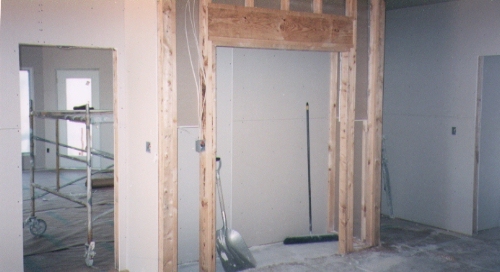 If a door frame is scratched or dinged, it will be hard to establish if that was done during the building process (the builder's responsibility) or while you were moving in (your responsibility). If you can get into the house prior to the scheduled final walk-through without getting in the way of the builder's people, you can do some of the things listed below. Many things you find may already be fixed by the builder before the final walk-through, but by checking things in advance while you can take all the time you want, you don't risk overlooking them at the final walk-through when the presence of others tends to make you rush a little. Rule #1 - Test everything that moves or turns on/off. The builder will be keeping the list and may try to rush you through things, but if you skip checking something out and it turns out later not to work, you may have trouble getting it fixed later. We did not have trouble with Craft in this regard, but why take the chance? Also, while checking everything else, watch for paint flaws, scratches, etc. Look for poorly joined sections in the baseboard and crown molding and door/window frames. It's very hard to make such joints completely invisible, but they should have at least tried to sand them down to the same level. Look in the circuit breaker box to make sure that all breakers are on and that they are all distinctly labelled for what they control. If the breaker box is outside, put a lock on it. Turn on every light and fan. After you make sure that the lights and switches work, make sure they are installed right-side-up (off is down, on is up -- this may not hold true for lights which are switched at more than one place, although with a light off, all switches controlling it should be pointing the same direction, up or down). Make sure that the switches are arranged in logical order. For example, at the front door, the switch closest to the door should control the light which is the fartherest out (such as the garage), the next switch should control the next light (such as the front porch), and so on, with the last switch being the entry/hall light. Don't forget to check outdoor lights. Test motion-sensor lights at night and make sure that the motion detector and the lights are pointed where you want them. The motion detector should not be pointed where trees moving in the wind will set them off. You can buy a simple circuit tester for a couple of bucks which will make checking the electrical outlets a lot simpler. The tester has a couple of leads and small light bulb. Stick the leads into a wall socket and if it is working, the bulb will light up. Check every outlet. Push the test buttons on smoke detectors. Check the heat and air conditioning. It is common, we were told, for the a/c coolant not to be fully charged; if you have floor vents, you may also find debris blowing out of them. We actually did not need the a/c for about a week after we moved in, but then it didn't cool. The repairman showed up about a half-hour after we called the builder, so we didn't really have a problem, but again - it would have been better to catch this earlier. Make sure that A/C returns have filters in them. Open and close every window and door; each one should latch/lock easily without having to give an extra push or pull. Windows should also open and close smoothly without any binding or grinding of metal. We found one window which would not crank open all the way. Window installers put large "X"s on the window frame that you can see while opening the windows. The people doing the final cleaning should get rid of those, but did not at either our house or Judy's. We specified hinge-mounted door stops on all doors because they are less obtrusive and work better than baseboard-mounted stops. Check to make that the door stops are there and, assuming hinge-mounted ones are used, that they are adjusted to stop the doors before they bang into cabinets, etc. Pull out all drawers and pull-out shelves to make sure they come out fully without sticking. Make sure that handles (if any) are squarely mounted. Check for cracks in the wood sides, front and back that make up each drawer. Check all cabinet door pairs to make sure that they do not rub against each other while closing. Also, open the doors and try to wiggle them up and down to make sure that the hinges are not loose. Water faucets should work easily without dripping. Make sure hot water is coming out. Shower controls have blocks on them to keep the handle from being turned to the point where you will get scalded, but make sure that it can still turn enough so that the water is hot enough to shower with. You don't want to be taking cold showers until the builder gets that adjusted. If you have an instant hot water system, make sure that hot water comes out right away. Check for leaks under the sinks and around water fixtures. Check all outdoor water faucets. Make sure all toilets flush and fill properly. Make sure that appliances are not scratched and don't have gummy residue where stickers were removed. Make sure all appliances are level and do not rock. Test-run all appliances. Some appliances have bolts or other materials in them for shipping which may keep them from running correctly if not removed by the installers. Make sure the garage door opener works from the push button, with the remote openers, and with the number pad on the outside door frame. Buy a can of spray lubricant (not WD-40, which is more of a penetrant, we were told) and spray the springs, wheels, and the tracks the wheels run in. Disconnect the door from the opener and make sure that the door opens and closes easily by hand (i.e. : that the spring tension is adjusted right). Check the driveway and sidewalk(s) for problems. Check the paint, trim, windows, doors, etc., in the garage. Check closets to make sure that hanging poles have supports where needed to keep them from sagging under the weight of hanging clothes. Check to make sure that a coat on a hanger will fit hanging up without hitting the back wall or the doors when they close. If a closet has sliding doors, make sure that they do not scrape against each other. If you specified extra-deep shelves to protect hanging clothes from dust, make sure that the poles are mounted under the center of the shelves. If too far forward, clothes will hang out past the edge of the shelves, defeating the purpose. Check everywhere for paint that changes color, overlaps (e.g. : between ceiling and walls), scratches, blemishes, etc. Check trim and other woodwork for dings, scratches, etc. Check carpeting to make sure that seams are not visible. Installers and builders like to claim that the seams will become less visible over time, but a carpet installer on a home TV program said that a good seam will never show. Look in the attic and in the crawl space just to make sure that everything looks okay. Walk around the house and look for any problems with the roof, walls, etc. The foundation slab or blocks (if you have a crawl space) should go at least several inches above the soil with no siding overlapping it. Siding touching the soil provides a way for termites to get into the house unseen. Get copies of manuals for all appliances, fans, etc. The soil should have been treated for termites before construction began. Get a copy of that inspection and arrange for a contract with the company for regular termite inspections. If you prefer a particular company, that should have been specified in your building contract.